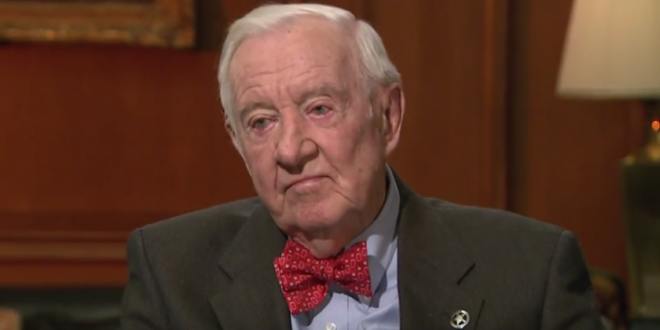 Retired SCOTUS Justice John Paul Stevens: Kavanaugh's Temperament Is Unsuitable For The Supreme Court - Joe.My.God. Retired U.S. Supreme Court Justice John Paul Stevens on Thursday said that high court nominee Judge Brett M. Kavanaugh, who Stevens once lauded in one of his books, does not belong on the Supreme Court. Speaking to a crowd of retirees in Boca Raton, Stevens, 98, said Kavanaugh’s performance during a recent Senate confirmation hearing suggested that he lacks the temperament for the job. Earlier this year Stevens penned a New York Times op-ed calling for the repeal of the Second Amendment. Appointed by President Gerald Ford, Stevens retired from the Court in 2010 after serving for nearly 35 years. He was succeeded by Obama appointee Elena Kagan.